theHUB 4you hostel& bar is the place to enjoy sun and sea. 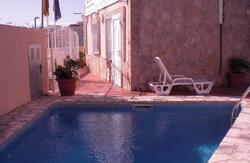 Calpe is famous for water sports and we're just two minutes from the beach. Join us this spring and summer for the best sea vacation you've ever had! Spacious rooms with the sea view or overlooking a lake with pink flamingoes; en-suite bathrooms, free breakfast and wifi. Shaded terrace to enjoy drinks from the bar and lazy conversations. Fun activities every night, including parties, pub crawls and so much more! Our team is a master of hospitality and we are looking forward to hosting you! theHUB is a non smoking property. Children under 8 years can only stay in a private room. Small pets can be accommodated, only in private rooms, please enquire before booking. Upon arrival to Calpe simply go down to the sea. or follow pointers to the tourist information center, it's next door to theHUB. or take any of the buses going around the city, all 4 routs stop two minutes from us, you need 'Banos de la Reina' stop.